Until now, I had never read an Audrey Niffenegger book. Shameful, I know. While I had heard all of the praise surrounding The Time Traveler’s Wife, I had never gotten around to reading a copy, despite shelving it every day when I worked as a student library page. Naturally, as soon as I had time to read it, I arrived at the library only to find that it was unavailable. Sitting in the place where The Time Traveler’s Wife should have been was a thin book called Raven Girl. The first thing that I noticed about the book was the cover. I know that they say never to judge a book by its cover, but in this case, my first thought – that the simple, self-explanatory picture and choice of font were reminiscent of a fairytale – was indeed correct. 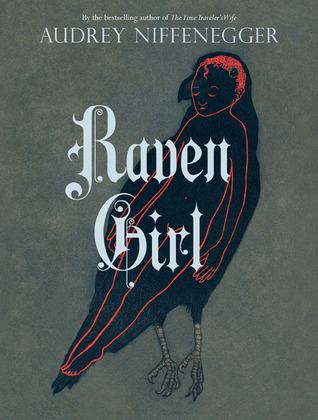 In Raven Girl, Niffenegger combines the modern magic of medicine and technology with the more traditional elements of princes, transformation and unlikely lovers to create an wonderfully unique Gothic fairytale. It’s quick read is supplemented by Niffenegger’s own illustrations which enhance the story and bewitch the reader. There were only a few things that I disliked about this story: the ending was quite abrupt, some details were glossed over, and the book was quite short (80 pages total, and not even all of the pages contained words). However these can be chalked up to the fact that the story is a fairytale, where such practices are commonplace. This story took me on a dark adventure that I really enjoyed. It’s not for everyone, but if you’re willing to embrace your inner child and suspend your disbelief for about half an hour, I recommend you give Raven Girl a try.